Despite its proud dedication to Gene Roddenberry's utopic vision, Star Trek occasionally goes pretty dark and - more often than not - does it really, really well. 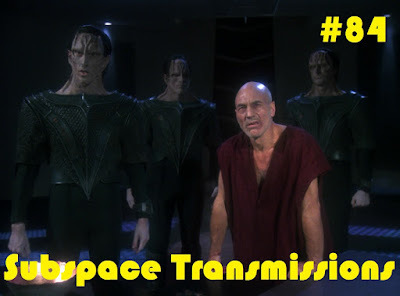 This week hosts Cam Smith and Tyler Orton, along with returning guest Jamie Davies, tackle arguably the most tense, uncomfortable and grim story in The Next Generation's entire run, as Picard's seemingly unwavering resolve is pushed to its very breaking point by merciless Cardassian sadist Gul Madred. Over the course of this hour long discussion the trio delve deeply into the combative relationships between both the Enterprise's brave leader and his captor, as well as Riker and stubborn senior officer Captain Edward Jellico, and determine whether this celebrated two-parter may actually be better than the beloved Best of Both Worlds. Wanna appear on the show? Shoot us a 30 to 60-second audio clip telling us your thoughts on CHAIN OF COMMAND and you could take the spotlight in an upcoming program! You can also send any other questions, topic ideas or feedback to subspacetransmissionspod@gmail.com!